If there is one good thing about red lights apart from being able to finish texting, it is the time that it allows you to look around, and discover new things. The other day, I was sitting at the light at Proctor and Swift and noticed that the little European Deli on the North-East corner was under new management, and was touting a new Chef. I’d eaten there a couple times before, so I decided to go and see what the new management had done to revolutionize things. An actual dining room was added. The menu, like before offered many Hungarian favorites, but there were also some traditional Polish dishes that were new to the menu. 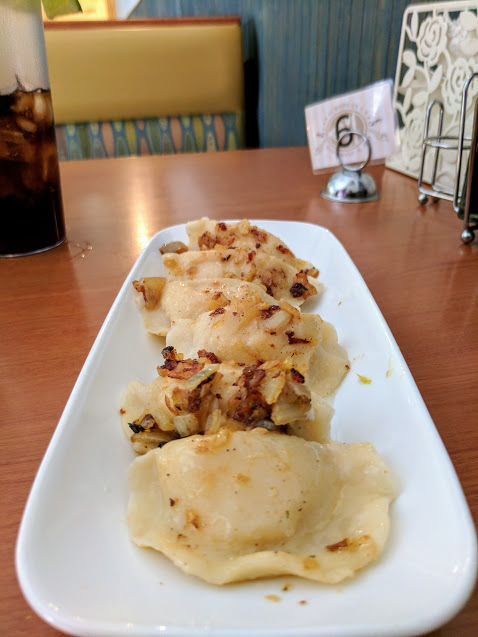 I started out with an order of six Cheese & Potato Pierogies that were topped with nicely caramelized onions. They were homemade and a treat with every bite. The outside was tender, and the filling was flavorful and blended perfectly with the sweetness of the onions. Fat-man that I am, I then moved on to a generous portion of stuffed cabbage with homemade noodles. 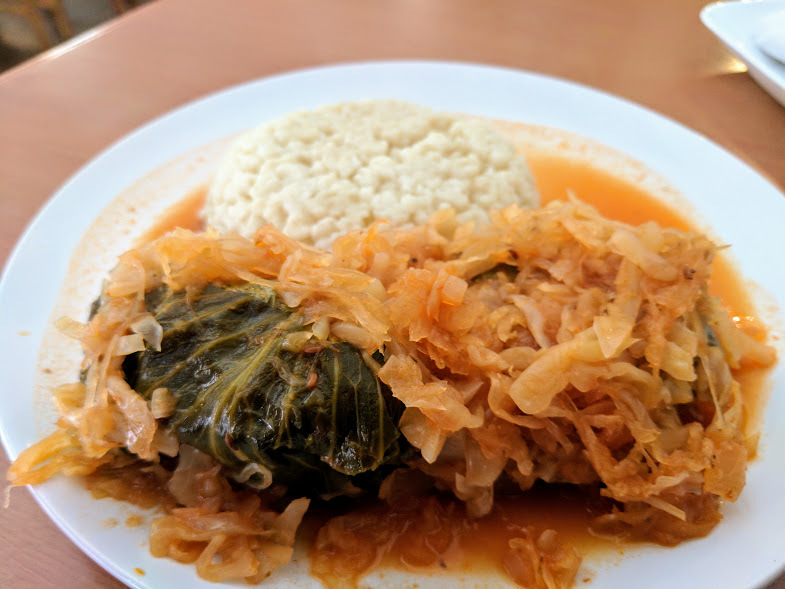 The cabbage rolls were flavorful, and I really enjoyed the sauce that was served over them…it was very light, yet added another layer of flavor. The sauerkraut was probably the star of the entire dish…homemade, like nothing you’ll ever taste in your life unless you go to the trouble and love of doing it yourself. I’m a sucker for “noodles.” In the part of Europe where my family comes from, we refer to them as “Spaetzle,” (because they look like little sparrows), but they are the same preparation. On their own with just a little butter, they are bland, but when mixed up with the sauce from the cabbage, the flavor is amazing. I’ve worked with a very talented Hungarian Chef in the past, and I know these flavors well. This food is true comfort food, and they did not disappoint! The owners were very gracious, and gave courteous service. Next time I go, I’ll have to save room for some pastries, as they had a beautiful case filled with a variety of decadant treats. European Restaurant & Deli is located at 2805 Proctor Road in Sarasota. I feel very lucky to have them just down the street from my home!